Many fish living in reefs near shore or in lagoons and estuaries are poisonous to eat, though some are only seasonally dangerous. The majority are tropical fish; however, be wary of eating any unidentifiable fish wherever you are. Some predatory fish, such as barracuda and snapper, may become toxic if the fish they feed on in shallow waters are poisonous. The most poisonous types appear to have parrot-like beaks and hard, shell-like skins with spines and often can inflate their bodies like balloons. However, at certain times of the year, indigenous populations consider the puffer a delicacy. Blowfish or puffer (Tetraodontidae species) are more tolerant of cold water. You find them along tropical and temperate coasts worldwide, even in some of the rivers of Southeast Asia and Africa. Stout-bodied and round, many of these fish have short spines and can inflate themselves into a ball when alarmed or agitated. Their blood, liver and gonads are so toxic that as little as 28 milligrams (1 ounce) can be fatal. These fish vary in color and size, growing up to 75 centimeters in length. 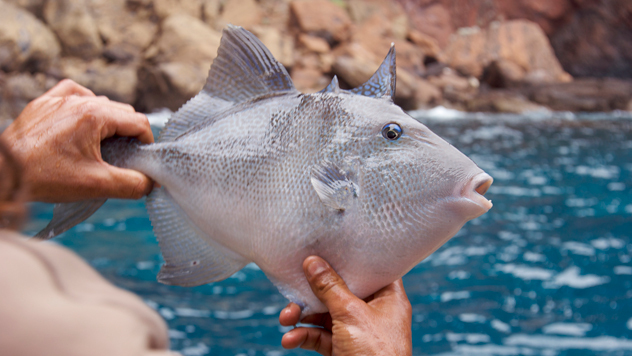 The triggerfish (Balistidae species) occur in great variety, mostly in tropical seas. They are deep-bodied and compressed, resembling a seagoing pancake up to 60 centimeters in length, with large, sharp dorsal spines. Avoid them all, as many have poisonous flesh. Most octopi are excellent when properly prepared. However, the blue-ringed octopus (Hapalochlaena lunulata) can inflict a deadly bite from its parrotlike beak. Fortunately, it is restricted to the Great Barrier Reef of Australia and is very small. It is easily recognized by its grayish white overall color and iridescent blue rings. Authorities warn that all tropical octopus species should be treated with caution, since many have poisonous bites, although the flesh is edible. The auger shell or terebra (Terebridae species) are much longer and thinner than the cone shells but can be nearly as deadly as the cone shells. They are found in temperate and tropical seas. Those in the Indian and Pacific oceans have a more toxic venom in their stinging barb. Do not eat these snails, as their flesh may be poisonous. This entry was posted in Year Zero Survival Blog and tagged fishing, safety, Survival food, what not to eat by staff-writer. Bookmark the permalink.